Paintings, drawings, sketches are, on their own, renderings that fascinate and often encourage introspection and often raise questions. I recently posted about an artist’s use of old books to create sculptures using the books’ pages. “In this exhibition, entitled Un, due, tre, fuoco (One, two, three, fire), the artist presents an unpublished series of works in which, with the use of an intense black mark, she intervenes on old books, notebooks and prints of different eras that could be seen both as supports and conceptual structures. 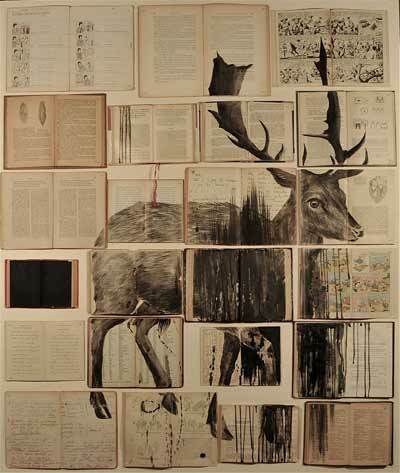 Short of visiting the gallery, take a look at the renderings on old books.